Industry analyst and market research firm Hypatia Research Group announces availability of a new primary research study entitled “Social Analytics & Intelligence: Converting Contextual to Actionable”. 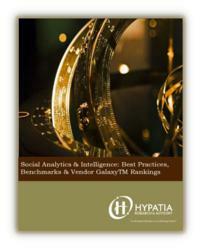 Featuring the unique Hypatia GalaxyTM Evaluation, in which 24 software vendors are evaluated by 12 criteria, this report showcase current trends, organizational challenges, best practices, and return on investment metrics utilized by top performing organizations via 50+ pages, 21 tables or figures and several case studies that focus on business return on investment. Hypatia Research Group surveyed more than 1200 global organizations for this research and found that only 526 respondents actually utilize, recommend, influence, and hold budget or veto power over the purchase of social analytics and intelligence software at their place of employment. As a result, only analysis derived from these 526 respondents was utilized for this research. How organizations set goals and objectives for investment in Social Analytics & Intelligence initiatives. Which role(s) are primarily accountable for these programs, and moreover, how should these teams be structured organizationally. How are organizations harmonizing customer’s online interactional information with transactional data stored within legacy systems such as CRM, marketing databases, financial systems or data warehouses? Which best practices or lessons learned from other organizations’ effective social analytics & intelligence initiatives might benefit my organization. Over 500 respondents with direct accountability for selection or use of social analytics software and services were utilized for this primary research. Company size of respondents is: 37.5 % large enterprises, 33.9% mid-market and 28.6% SMB. Geographic breakouts are: 49.1% North America, 26.7% EMEA, and 24.5% Asia PAC: Australia, China, Japan, and Korea. Potential customers of this research may download a 20 page executive summary by signing up to receive Hypatia Research Group newsletters using this link; http://store.hypatiaresearch.com/index.aspx?dc=HRG:SocAnal&Intel. Industry analyst and market research firm Hypatia Research Group http://www.HypatiaResearch.com delivers high impact market intelligence, industry benchmarking, best practice, and vendor selection research for how businesses use technology and service providers to capture, manage, analyze and apply customer and market intelligence to enhance performance and accelerate growth. Coverage includes: CRM, Business Intelligence, Customer Analytics, Social Media, Marketing Automation, Information Management, and GRC. Since 2001, clients have relied on us for industry insight, expertise and independent market research for guidance in assessing various technology and service options.